Easily enter player names and numbers. Number One in Custom T-shirts and Custom Team Jerseys Since 1999! Experience you can trust! Welcome to Recwear, your number one online source for custom team jerseys and custom tshirts. Since 1999 Recwear has provided literally thousands of custom team jerseys and uniforms for sports teams all across the U.S. Recwear specializes in custom t shirts for recreational leagues and church leagues for basketball, softball, baseball, volleyball, soccer, football, lacrosse, and now hockey! Lots of companies offer custom team jerseys online but no one takes the hassle out of t shirts like Recwear. Our unique product builder allows you to choose a team jersey, change its color, add a custom team logo, add player names and numbers, all in 3 easy steps! We guarantee your absolute satisfaction! * Emailing your own design is subject to approval from our graphics department. Send us your image and we'll let you know if it will work for your order! Looking for a great team fundraiser? Every team wants to show team spirit. What could be better than a custom team jersey or sports uniform? Get in the game with customized team jerseys and uniforms from Recwear. Personalize your graphics and logos to show off your team spirit. 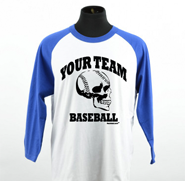 Enjoy custom sports jerseys for your recreational league, school sports team or church teams. Check out Recwear’s News Link where you can check on company updates and rec league news! Order your team’s custom sports uniforms with complete satisfaction and security. Absolutely the best way to order custom screen printed t-shirts and jerseys online! We are so confident you will be completely satisfied with Recwear quality team uniforms and service that we offer all of our customers an exclusive Recwear Guarantee.